Today was the second Saturday of the 2015 Fiesta and it was a great day for flying. The morning saw a beautiful dawn patrol with the moon and mountains in the background. As they took off to a large group and drifted south before climbing and heading north the sun peeked over the Sandias. 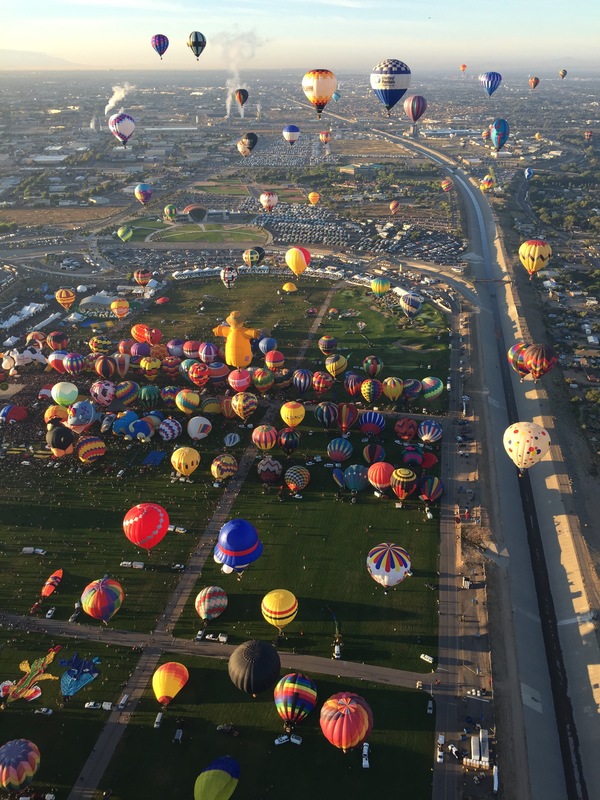 As the many balloons inflated and took off the New Mexico blue sky shine brightly. After more than an hour of balloons taking off the field was open for landing and many of the balloons that had taken off and boxed north returned to the green grass of Fiesta Park. The morning balloons included many of the special shapes again as well as the standard balloons making for some great photography moments. Take a look at a few of the pictures we captured during our morning on our Facebook page.